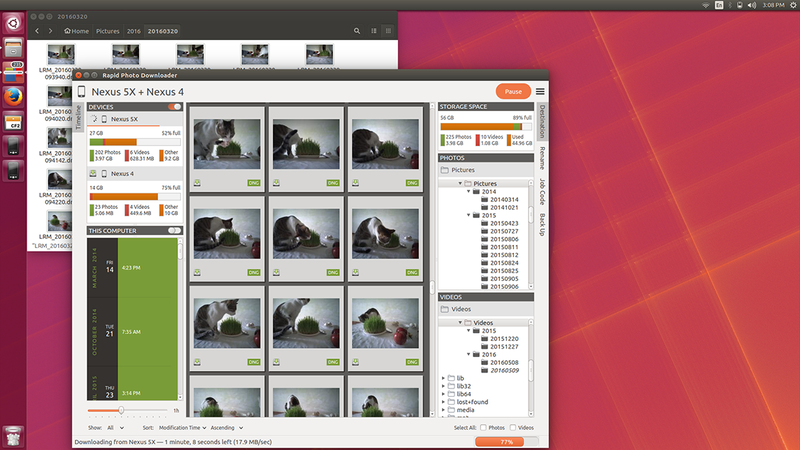 After two and half years of development, Damon Lynch is proud to publish a major new version of the Linux desktop's premier photo and video downloader/importer. 1Every aspect of the user interface has been revised and modernized. 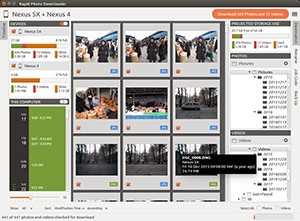 2Files can be downloaded from all cameras supported by gPhoto2, including smartphones. Unfortunately the previous version could download from only some cameras. 3Files that have already been downloaded are remembered. You can still select previously downloaded files to download again, but they are unchecked by default, and their thumbnails are dimmed so you can differentiate them from files that are yet to be downloaded. 4Unique to Rapid Photo Downloader is its Timeline, which groups photos and videos based on how much time elapsed between consecutive shots. Use it to identify photos and videos taken at different periods in a single day or over consecutive days. A slider adjusts the time elapsed between consecutive shots that is used to build the Timeline. Time periods can be selected to filter which thumbnails are displayed. 5The mechanism to specify file renaming and subfolder generation rules is now totally revamped, with an easy-to-use color-coded editor. 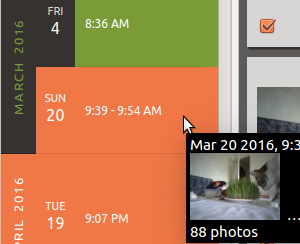 6Thumbnails are bigger, and different file types are easier to distinguish. 7Thumbnails can be sorted using a variety of criteria, including by device and file type. Thumbnails for previously downloaded files can be hidden. 8Destination folders are previewed before a download starts, showing which subfolders photos and videos will be downloaded to. Newly created folders have their names italicized. 9The storage space used by photos, videos, and other files on the devices being downloaded from is displayed for each device. The projected storage space on the computer to be used by photos and videos about to be downloaded is also displayed. 10Downloading is disabled when the projected storage space required is more than the capacity of the download destination. 11When downloading from more than one device, thumbnails for a particular device are briefly highlighted when the mouse is moved over the device. 12The order in which thumbnails are generated prioritizes representative samples, based on time, which is useful for those who download very large numbers of files at a time. 13Thumbnails are generated asynchronously and in parallel, using a load balancer to assign work to processes utilizing up to the number of physical CPU cores. Thumbnail generation is faster than the 0.4 series of program releases, especially when reading from fast memory cards or SSDs. Learn about the under the hood design of version 0.9.0. (Unfortunately generating thumbnails for a smartphone's photos is painfully slow—read why here). 14Thumbnails generated when a device is scanned are cached, making thumbnail generation quicker on subsequent scans. 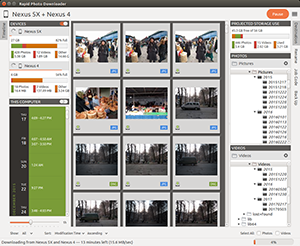 15Libraw is used to render RAW images from which a preview cannot be extracted, which is the case with Android DNG files, for instance. 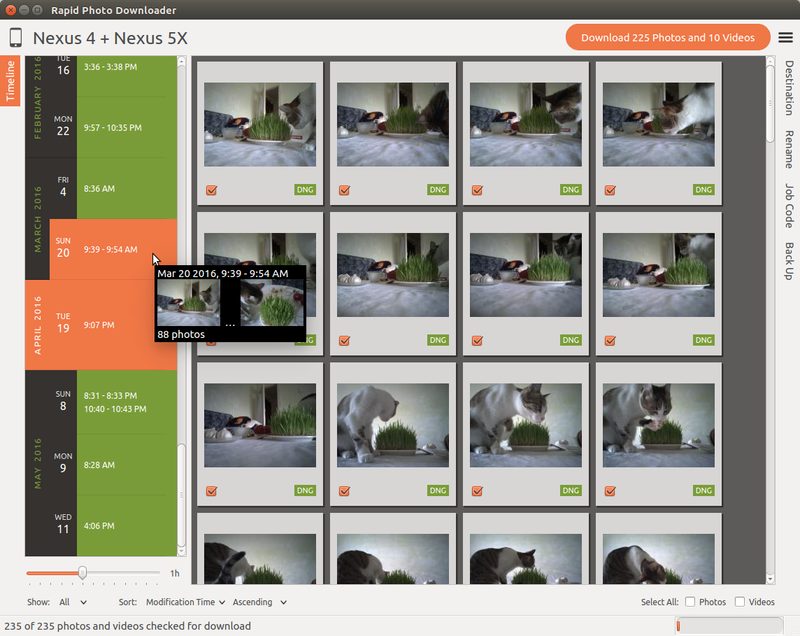 16Freedesktop.org thumbnails for RAW and TIFF photos are generated once they have been downloaded, which means they will have thumbnails in programs like Gnome Files, Nemo, Caja, Thunar, PCManFM and Dolphin. If the path files are being downloaded to contains symbolic links, a thumbnail will be created for the path with and without the links. While generating these thumbnails does slow the download process a little, it's a worthwhile tradeoff because Linux desktops typically do not generate thumbnails for RAW images, and thumbnails only for small TIFFs. 17The program can now handle hundreds of thousands of files at a time. 18Tooltips display information about the file including name, modification time, shot taken time, and file size. 19Right click on thumbnails to open the file in a file browser or copy the path. 21Audio files that accompany photos on professional cameras like the Canon EOS-1D series of cameras are now also downloaded. XMP files associated with a photo or video on any device are also downloaded. 22Comprehensive log files are generated that allow easier diagnosis of program problems in bug reports. Messages optionally logged to a terminal window are displayed in color. 23When running under Ubuntu's Unity desktop, a progress bar and count of files available for download is displayed on the program's launcher. 24Status bar messages have been significantly revamped. 25Determining a video's correct creation date and time has been improved, using a combination of the tools MediaInfo and ExifTool. Getting the right date and time is trickier than it might appear. Depending on the video file and the camera that produced it, neither MediaInfo nor ExifTool always give the correct result. Moreover some cameras always use the UTC time zone when recording the creation date and time in the video's metadata, whereas other cameras use the time zone the video was created in, while others ignore time zones altogether. 26The time remaining until a download is complete (which is shown in the status bar) is more stable and more accurate. The algorithm is modelled on that used by Mozilla Firefox. 27The installer has been totally rewritten to take advantage of Python's tool pip, which installs Python packages. 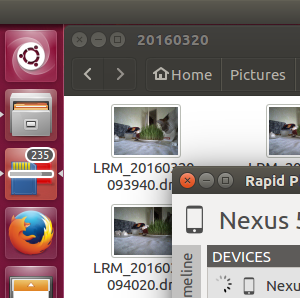 Rapid Photo Downloader can now be easily installed and uninstalled. On Ubuntu, Debian openSUSE, and Fedora-like Linux distributions, the installation of all dependencies is automated. On other Linux distrubtions, dependency installation is partially automated. Work is underway to enable the installation of the program using Snap and AppImage. 28Job Codes are now easier to assign. You can assign Job Codes to sets of photos and/or videos before starting the download. 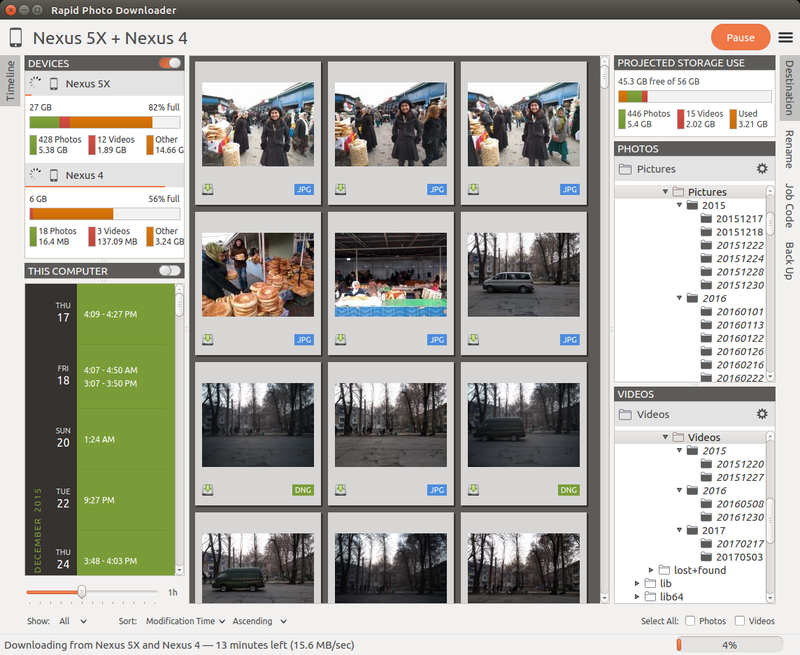 That way you can efficiently apply a variety of Job Codes to different sets of photos and videos in the same download. Job codes are shown in the upper portion of each thumbnail. When choosing a Job Code, whether to remember the choice or not can be specified. 29The graphical user interface is considerably more responsive when the program is under heavy load. 30A check for a new version is run at program startup. If the program was installed using python's packaging system pip, and the latest version can be upgraded without new system dependencies, the program offers to download the new version and install it with minimal user intervention. 31In the error report window, error reports are now grouped by task: scanning a device, copying from a device, finalizing download subfolder and filenames, and backing up. Furthermore, reports now contain hyperlinks to the files on the filesystem and/or cameras, allowing easy access to them using a file manager. 1Rotate Jpeg images - to apply lossless rotation, this feature requires the program jpegtran. Some users reported jpegtran corrupted their jpegs' metadata—which is bad under any circumstances, but terrible when applied to the only copy of a file. To preserve file integrity under all circumstances, unfortunately the rotate jpeg option must therefore be removed.